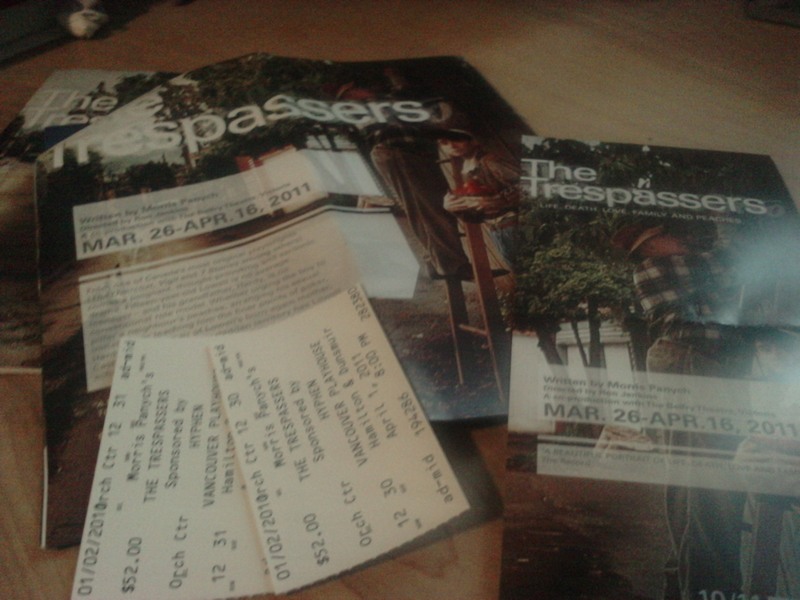 Real Theatre: “The Trespassers” at The Vancouver Playhouse | Damian Trasler's Secret Blog - Do Not Read! Today’s secret is a biggie, one so shocking, I really had to think about confessing or not. Folks, I don’t go to a lot of live theatre. I know, a lot of you just fell off your chairs, or stormed out in indignation. “Why, this fellow claims to be a playwright and script reader, yet he does not regularly attend stage performances of a theatrical nature! Disgraceful!’ Please, calm down, mop up your coffee and I’ll explain. When I was small, my father wrote plays for our church. They were (and are) very good, and I got to act in them. Since I was around the house a lot, I got to help with making the props and scenery. I acted in Dad’s plays all through my youth, and then joined a Youth Group that also put on Pantomimes. 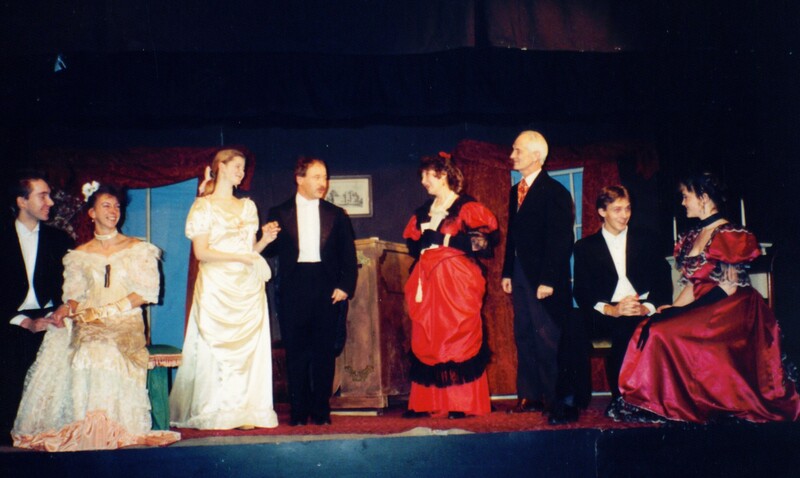 I joined a couple of village Community Theatre groups, one of which performed “Charley’s Aunt”. See me in that production below, second from right. When we took up our nomadic RAF lifestyle, I joined the Royal Air Force Theatrical Association (RAFTA), and entered a couple of their One Act Play Competitions. This was my first attempt at writing. Of course, along the way, my wife and I attended many performances of many great things at various theatres. So, to be fair, I’ve had a lot of experience of live theatre, both on and off stage. Perhaps I should have said I don’t get to see as much live theatre as I feel I ought to. This last week I got to go to “The Trespassers” by Morris Panych at The Vancouver Playhouse, thanks to my brother and sister-in-law’s generous Christmas present of a gift certificate. Mrs Dim and I picked the production almost at random, and I did not have high hopes. You see, I dread the theatre sometimes. People so often write plays to communicate with melodrama, to wring the last drop of angst out of a dire situation. Sometimes, yes, that’s effective, or moving. Often it’s excruciating. In “The Trespassers”, we were promised a “poignant, thought-provoking and sardonic drama”. I would have said they missed out FUNNY. Not clown funny ( or clown CREEPY, more like) but with genuine wit and warmth. The lead character has a condition, but we don’t get medical analysis, or hand-wringing over diagnosis and treatment. We see Lowell is different, but since he’s our guide and narrator, we take him as he comes and see the story through his eyes. You want to know what it’s about, well, go see it. If you’re in the neighbourhood, you still have time, it runs till the 16th of April. What I want to talk about is the brilliance of it. A single set, with one central exit on the back. Light bulbs overhead that could simulate the peach orchard when necessary. A stool on one side of the stage that was Hardy’s shed from time to time. A table that was in Lowell’s house, or Roxy’s house, or the interrogation room of the police station. What was brilliant about the staging of this piece was that there was no attempt to define individual locations in space or time. The police officer (while in the interrogation room, we assume) would ask a question and Lowell would begin to answer. But because he was relating what had happened in the past, the characters he was talking about would interrupt him, explain things. One part I remember vividly was a section where the police officer had no role in the scene, but he was still onstage. He simply sat on a stool to one side, but when Hardy talks about the view from the orchard, pointing off into the distance over the audience’s head, the policeman looked back too, as if he was watching like we were. Which, in a sense, he was. What excites me so much about this play and its presentation is that I read so many scripts each month that don’t do anything as challenging as this. I wondered if I had read this piece, would I have been able to envision it as clearly? Morris Panych (an experienced actor, writer and director)has written a play about a complex series of experiences leading up to a difficult choice. He has five characters interacting, creating multiple locations and months of passing time without set changes. Watching the play, it’s easy to overlook the simplicity of the set, but this play could be performed in a school hall, or a church – you don’t need any moveable flats, you barely have any props, the only special effects were for grace touches. I doubt I’ve managed to convey the point I wanted to make. Too often, we view plays as a kind of movie. We forget what theatre IS, what it can be, that audiences at a play will accept quite radical and strange ideas because this is theatre. I didn’t want to stand up during the poker game and yell that they were playing cards on the interrogation room table. For that scene, it WASN”T that table anymore, it was in Roxy’s house. Everybody knew that, everybody accepted that, and we didn’t need anyone holding up a subtitle s card to explain the change of location. No, I don’t go to live theatre often enough. And if plays like this are everywhere, then I am really missing out. What was the last piece of live theatre YOU saw? Did it challenge you, or disappoint? This entry was posted in Uncategorized, Writing and tagged Charley's Aunt, Damian Trasler, Morris Panych, plays, playwright, RAFTA, The Vancouver Playhouse, theatre, writing. Bookmark the permalink. You don’t go to live theatre? What kind of man are you? We have quite an active theatre community here in Saint John, NB, although I’m not involved except as a spectator. There are a lot of talented scriptwriters here, it seems. Pingback: Bard on the Beach – Shakespeare in the Summertime! | Damian Trasler's Secret Blog – Do Not Read!